Updated by Th3Guy! Although it's still in v0.1, check post 2 for a preview of v1.0. Models made in Google Sketchup. [u]Info:[/u] This is one of the most commonly found butterflies. They spawn frequently on grass and soil. [u]Info:[/u] Another very common butterfly. Only found at day or in light areas. [u]Info:[/u] Another very common butterfly. Only found at night or in dark areas. [u]Info:[/u] Commonly found in forests. They will be resting on trees. It's texture makes it harder to spot. [u]Info:[/u] Commonly found in forests. They will be resting on white trees. It's texture makes it harder to spot. [u]Info:[/u] Commonly found in snow biomes. [u]Info:[/u] Spawns near cacti. If you find some cacti there is a big chance of seeing one. Cacti won't hurt them. [u]Info:[/u] Spawns near pumpkins. If you find some pumpkins there is a big chance of seeing one. [u]Info:[/u] Spawns near reed/sugar canes. If you find some reed/sugar canes there is a big chance of seeing one. [u]Info:[/u] Commonly found in the Nether. Lava and Fire won't hurt them. [u]Info:[/u] Notch once said that he thinks of creepers as leaf monsters. This butterfly likes the creepers and spawns near them. Explosions won't hurt them. [u]Info:[/u] Rare butterfly. There is a very small chance of it spawning but it spawns in common places. [u]Info:[/u] Found commonly in deep caves. [u]Info:[/u] They spawn near or on lava (flying over it) however they can still burn by the lava. This means that it's hard to catch. [u]Info:[/u] Spawns near mushrooms in underground caves. [u]How to use:[/u] Right-click ,while wielding it and pointing at a Butterfly, to catch it. [u]Note:[/u] I am aware that you will have to collect string before you can actually catch one. This may serve a problemm if you see a rare butterfly but don't have any string. I got one thing to say at that moment: Bad Luck, m8. [u]How to use:[/u] Just keep it in your inventory while catching a butterfly. The butterfly will go in the jar and this will result in a Jarred Butterfly (butterfly texture + jar texture). Right-click while holding it to release it. Once released, it won't despawn. This makes it possible to keep the butterflies as pets. Collect them all! I hope you like my idea and support it. If you are a modder, please consider making this. If you have any suggestions of making this idea better, please post them. Keeping 2 Butterflies in an enclosed area would end up in mating. This would result in the spawn of a caterpillar. Depending on what species you used for creating it, it will transform in a special kind of butterfly. If it won't result into a special breed it will result in one of the 2 parent butterfly species. [u]Info:[/u] Not a hard breed and will be good for testing. [u]Spawn Conditions:[/u] Mating a Minecraft Regular Butterfly and a Snow Butterfly. [u]Info:[/u] Harder Breed, but will have a special dust drop (See section below). [u]Spawn Conditions:[/u] Mating a Cave Butterfly and Ash Butterfly. Some Butterfly species will randomly spawn dusts/ powders when caught. This could result in some farming, but they won't spawn it very frequently. Adds a craftable encyclopedia/journal that will give certain hints of butterfly locations (only some of them). 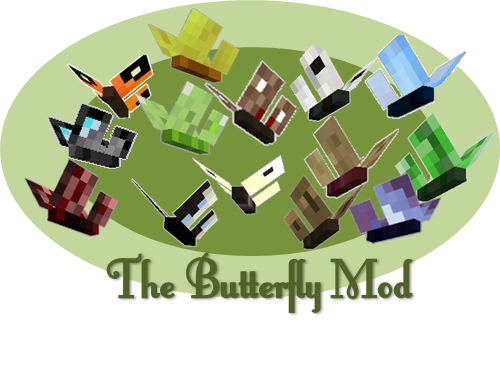 When caught information about the butterfly will be added by the player. Thanks to Seiseki for the idea and gui image. These will all be spawning in version 1.0 unlike in the current version. Have a problem? ether dig a hole or blow it up! EPICNESS IN A BOX! This time really! IN A BOX! Best Idea ever, I hope it is implemented. Peace! While it's certainly a nice idea and could make environments look that much more alive, is there a way that you could come up with something to give it a bit more use beyond simply decoration? Perhaps you can use a dead butterfly's scales for something? Or maybe releasing a butterfly near flowers will allow you to grow more flowers? Maybe butterflies should drop dyes that correspond to their wing colors. Looks pretty cool but i wont download it if someone makes it cuz it doesn't really help u but nice idea. This is such a great idea! =D, I can't wait until this comes out. Not only does it add a nice mob for atmosphere and gives people that like to explore something to collect =D and show off in their homes. If I knew Java this would be the first minecraft mod I would make. What is that you're telling me? Damnit... Their wiki says otherwise. Velvokay said since the MCP was released, he could work on the crab some more. GENERATION 17: The first time you see this, copy it into your sig on any forum and add 1 to the generation. Social experiment. There should be a group of modders that work on requests from the Mapping and Modding section. Then this would be made and mabey JurrasiCraft can be made to(probably would take a long time concidering its epicness).